Sisters Monica & Daniela come from a long line of Tibaldis, many of whom lie on the same road close to the village of Pocapaglia in the Roero. It was their great grandfather Stefano who began working the vines during the early 20th century, followed by his son Tunin when he wasn’t working in a factory, inspiring the girls to launch the family cantina/winery in 2014. They’re supported by their father Stefano, a gifted ironmonger who doubles up as a ‘trattorista’ (tractor driver) in his spare time, & by their mother Margherita, a cowgirl from Saluzzo. 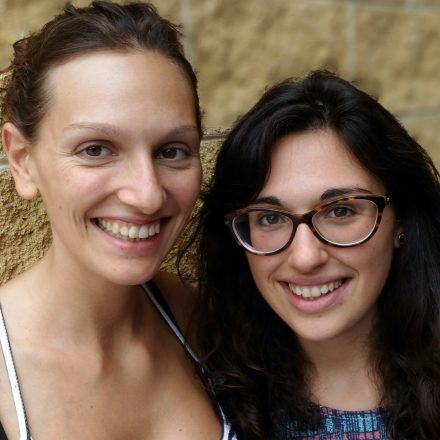 Daniela (& Monica) trained in accountancy, then as a sommelier, while her older sister Monica studied viticulture & enology at Turin University, followed by a further year in Asti & a Masters in Madrid! They have close to 7ha in total, located in three distinct MGA zones: Mormoré & Bricco delle Passere in the commune of Pocapaglia & the Costa Anforiano vineyard in Santa Vittoria. In Pocapaglia the hilly soils are Miocenic marine sand (stone), rich with fossils in origin, ideal for their two key white grapes/wines: Favorita & Arneis. In 2012 they identified a perfect 0.7ha Nebbiolo vineyard for their Roero DOCG: Costa Anforiano, that lies on limestone white Marne Sant’Agata clay soils, looking across the Tanaro river valley at Verduno; their debut vintage was 2014. They also make some Barbera & Nebbiolo d’Alba. The whites are classically vinified in stainless steel, using wild yeasts from vintage 2015. The Roero DOCG was initially aged in used barriques but the girls have decided that botti grandi is the future, switching to botti grandi with the 2015 vintage, & then investing in one of 10HL & another of 25HL for the 2016 harvest. They farm organically, & converting to certified from 2014. 2017 Langhe Favorita – tasted March’18, bottled Feb ’18 with DIAM2, 13.08%abv! No ‘Selection Danielle’ was produced in 2017, as the old Favorita vines struggled with flavoscenza dorata & drought; hence all their fruit was blended in with this ‘super Langhe Favorita!’ Pocapaglia (& the Roero) is famous for Favorita, lending weight to the belief the category should be reclassified as ‘Roero Favorita’! The Tibaldi Favorita fruit comes from two hills close to Pocapaglia: Mormore & Bricco delle Passere; the former lies on sand dune soils at 320m asl, behind the cantina & was first planted by the girls’ grandfather way back. Whole bunch (with stalks), mostly free run & some pressed juice. Love the pale (white?) colour, racy lime spremuta nose, from those loose, open bunches, with shellfish freshness, pebbly, Riesling esque, wonderful pithy (stalky?) texture, so light on its feet, cleansing acidity, drawing on those ancient sandy seabed soils of the Roero! 2016 Langhe Favorita ‘Selection Danielle’ – 13%, bright chrome gold, focus, compelling, tight grassy, pebbly lime, Mosel-ish talc refreshment & transparency, brambly apple (core); Sapid, minerally, lemon/lime, quasi Sauvignon-esque, a sense of skin, grassy, lovely flowing, but bright & precise, refreshing, salty, great with rice salads! 2014 Langhe Favorita ‘Selection Danielle’ – vinified stainless-steel, not the current (2016) vintage but proof indeed that Pocapaglia is the ‘capital’ of Favorita! Great intensity but still so slender, & not extracted or concentrated. Retains that racy, almost Mosel Riesling esque, salty, pebbly fruit. Very much a wine of the (Pocapaglia/Roero) soils. A real eye-opener to the brilliance of Favorita (in the right soils & hands!). Surely deserves the title ‘Roero Favorita’?! 2017 Roero Arneis – tasted 2nd March’18, from tank, just prior to bottling (5th March! ); 13% abv, also from Mormore & Bricco; 30% destalked; as you might expect from ‘Nebbiolo Bianco’ bunches, compact with darker colour, thick skins, & richer extract (than the pale Favorita). More melon, lemon/lime meringue, rounder, juicier than Favorita, Crunchy, generous, square, richer extract & phenols, reminds me of Fiano di Avellino (in a way!). Still in tank, still raw, needs time in bottle! 2016 Roero Arneis – 13%, vinified stainless-steel, bottled March 2017; the Tibaldi family have their (30 yo) Arneis vineyards largely on the Bricco delle Passere hill. Distinctly darker in colour (young gold vs white Favorita), the nose is richer too, with an acacia, lime flower, ginger character. Fuller, juicier than the pebbly Favorita, it’s still beautifully transparent, with straw-like warmth & a hint of greengage fruit. Needs time in bottle. 9k bts. 2017 Roero Arneis Bricco delle Passere – tasted from tank, March ’18, prior to bottling in June ’18! 13%, whole bunch, no pressed, only free run juice, indigenous yeast fermented. With the adoption by the Roero of the Menzione Geografico Aggiuntive (MGA) zonal/vineyard system in 2016, the Tibaldi’s have been able to rename their formerly ‘Selection Monic’, Bricco delle Passere, from 28 yo vines on red sedimentary sand. No surprise then at the mandarin & lemon/lime aromas, but in piu, it’s broader, more complexity, finer, emphatic, white stone texture/weave, rich, taut, profondo, with salty roots! 2016 Roero Arneis ‘Selection Monic’ – 13%, vinified stainless steel, more of everything, cryoextracted for richer, almost Traminer texture, warmth/character, a complex wine with a notable structure. Needs time. 2015 Nebbiolo d’Alba – 13.5%, both from the Bricco delle Passere & Costa Anforiano vyds, vinified in s/steel, 30% of which aged in used barrique in 2015 (ditched in 2016 in favour of s/steel only); fascinating nose dried curry plant notes, mixed with warm strawberry & cassis, engaging, generous, easy drinking, benchmark plus. 2016 Roero DOCG – tasted 9th July’18, post 25th June bottling, 14.3%abv, from their single Costa Anforiano vyd in the village of Santa Vittoria, aged for the first time in their cantina & in two new Garbellotto 10HL botti grandi; precise, transparent, focus, cool white stone (gesso/chalk?) rose, melograno (pomegranate) & wild strawberry/cassis crunch, rosehip intensity, also of darker 2016 blueberry-esque fruit, lots of detail beautifully woven together, exciting, energetico, delicate, it flows, racy Roero…so pretty, so exciting, a new dawn! Needs time to bounce back from bottling. 2015 Roero DOCG – tasted March ’18, 3k bts, aged in botti grande this vintage, from 3 yo young vines planted in the fine Costa Anforiano vyd in the comune of Santa Vittoria, very close to the Tanaro river valley, on peroxide white Marne Sant’Agata calcareous soils, chalky even; the heat of July/August 2015 is reflected in the super strawberry & (oak) spicy fruit, white musky & perhaps a whiff of earth. Decadent, drinking.